If you are a lover of old things and want to enjoy your time in the city exploring the old and interesting things, then this museum will be the perfect option for you. This is the place which is most commonly known as the Maritime museum, as it shows the relics of the sea voyages from the past till the present. This place is a wonderful experience. There are convenient travelling options for the handicapped people. The most interesting attraction of this place are the treasures that it showcases which is considered to be one of the most precious ‘sights’ in the world. 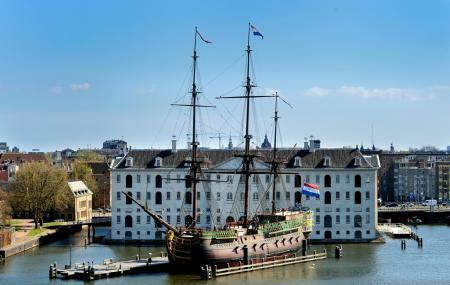 The museum is housed in the historic building the Arsenal, the storehouse of the Royal Dutch Navy dating from 1656. The museum collection together with the library houses one of the biggest maritime collections in the world and shows how Dutch culture has been shaped by the sea. Stimulating, interactive exhibitions allow visitors to explore 500 years of maritime history. The replica ship of East Indiaman moored beside the museum is the largest collection piece and stands out as one of the most popular things to do in Amsterdam. A visit to The National Maritime Museum is educative and inspiring for all ages and backgrounds. There is also a free audio tour of the museum highlights. The museum has a shop and a restaurant. You can take all day long or you can manage to check the whole place within a couple of hours. €7.50 Child (5-17 years), Stadspas holders and CJP. Free for children 0-4 years, National Museum Pass, Friends Fleet, I amsterdam City Card, Rembrandt Society, ICOM, Holland Pass ticket. Restaurant Stalpaert - located in the premises of the museum offers pure quality food. The Stalpaert restaurant - located in the premises of the museum and it offers multiple delicacies. The Pancake Bakery is a specialty restaurant for Dutch cuisines. The Grasshopper Coffee Shop is for tea and coffee. How popular is The National Maritime Museum? People normally club together Fort Pampus and Oude Kerk while planning their visit to The National Maritime Museum. Wonderful maritime museum. Everything creatively displayed and the replica full size ship is superb for children and adults alike. Watch your head! The Sea of Tranquility display is very surreal but so thought-provoking. Highly recommended. Could have spent all day there. A great maritime museum with varied exhibits throughout. The highlight of course is going on-board the ship and seeing the other outside exhibits but those inside are interesting and educational too. The museum is in distinct parts and over many floors so a visit can be quite tiring. It has a shop and a restaurant that looked good, although I didn't eat here. Great big museum about everything related to ships! You can learn a lot about the Dutch shipping tradition, sea fairing, and the whole experience is surprisingly entertaining. Cozy atmosphere. Many fun interactive exhibitions. The ship is very detailed including sounds and smells of the day. The main museum has wonderful maritime art both centuries old and new. There are spacious lockers for coats and backpacks. A hard carry on sized suitcase might not fit but a soft carry on sized backpack will. Each ticket can get a locker. There is an English only guided tour and a self guided audio tour in many world languages. Good for youngsters and adults. It is a favorite of locals also. Several interesting galleries regarding maritime and of course the live size boat, which every adult would enjoy just as much as the kids! Don't bang your head..! Very reasonable price, especially for students and kids. Try the audio tour, it's easy to carry along and fun to listen to some details. Check which galleries are open when visiting, remember to check the opening hours and reserve enough time, we spent over two hours easily. If I only had to visit one museum in Holland, it would be this one!